Spring flowers are almost a cliche. It’s difficult to paint them without getting too saccharine. But that is why we love them, isn’t it? Part of my spring busyness, as mentioned in an earlier post, is that I get carried away when I’m at the nursery. I always buy too much and then have to plant everything. This particular flowerbed is out by our woodshed and is probably the oldest one on the property. I think the rock wall was actually a base for a chicken coop, if I remember correctly what the former owner told us. The yucca and the weigila were already there but I’ve planted everything else. It’s always a fight between me and the wild critters who have eaten plenty of expensive perennials over the years. Since this flowerbed is furthest from the house, it generally gets the least attention so the plants have to be pretty hardy. I painted this 12 x 16 oil yesterday morning. I love the strathing light. There was a nice breeze and low humidity so it was a pleasure to be at the easel again. 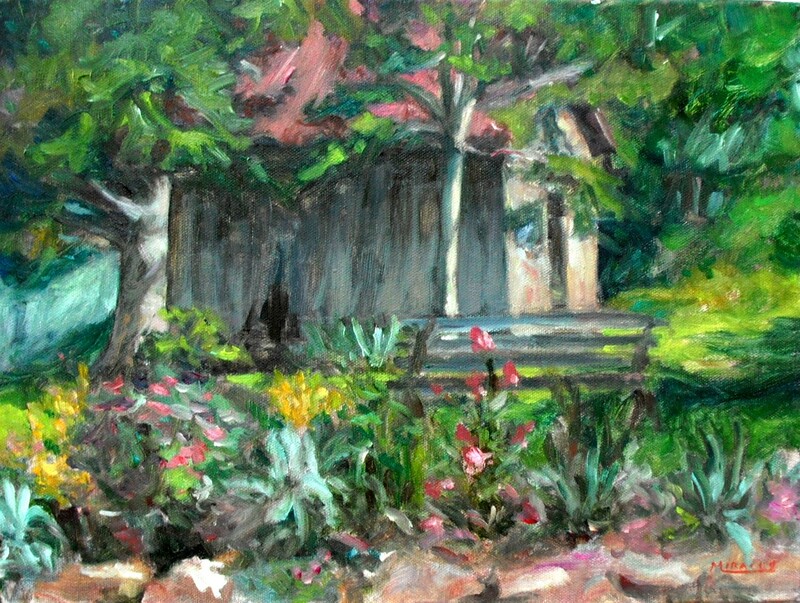 This entry was posted in art, country living, plein air painting and tagged art, country living, kit miracle, oil painting. Bookmark the permalink. Absolutely love the colors! This is very ‘springy’ indeed. I could see myself at ease here with Mother Nature at my side. Wonderful piece. Thank you. Yes, it’s a peaceful spot. The day was cool with low humidity, always a plus for plein air painting. I like the quality of light in this one. And, lots of great greens! Thank you! Green is so difficult to handle without it taking over the entire landscape. I appreciate your comments. on a website or if I have something to contribute to the discussion. Usually it is triggered by the passion displayed in the post I browsed. you. Could you make a list the complete urls of all your communal sites like your linkedin profile, Facebook page or twitter feed? No, I think most people are sincere when they post. Some may be looking to run up their numbers for internet hits but I believe that most are truly interested.